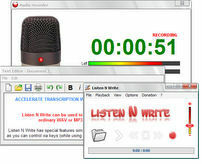 Listen N Write is a tool that makes it easier to transcribe audio and video recordings by letting you play and type in the same applications. You can control via keys (while using its integrated word processor) and insert time markers (bookmarks). When you press the Pause key, the audio stream is automatically rewound a few seconds. Very useful in certain situations. NOTE: This portable version of the tool includes no installer.